North Africa’s vast desert grew by 10 percent in the past century, driven primarily by fluctuations in the Atlantic Ocean. But climate change has also been a factor. New research shows that the desert covering much of North Africa has expanded by 10 percent in the past century, a potential catastrophe for the poor and unstable region and a warning to the rest of the world about the dangers of climate change, according to University of Maryland researchers who published their findings on March 29 in Journal of Climate. Nigam and his colleagues used rainfall records from 1920 to 2013 to track the size of the Sahara. 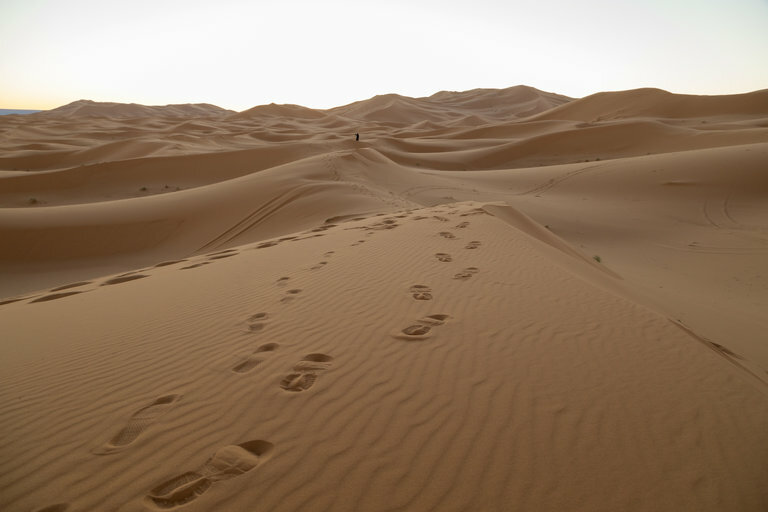 Deserts are defined as a region that receives less than 4 inches of rain annually. They found that the desert expanded by 16 percent on average in the summer and shrunk again in the winter when precipitation resumed. Over time, however, the desert’s growth outpaced its retreat. The US Department of Defense's National Defense Science and Engineering Graduate Fellowship Program and the US National Science Foundation supported their work. 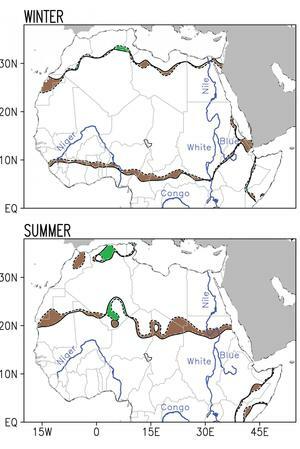 This pair of images shows the change in the boundaries of the Sahara Desert during the period 1920-2013, broken down by season. Dotted lines show the boundary as it existed in 1920, while solid lines show the boundary in 2013. Both boundaries are averaged across the three months of each season. (Winter = Dec-Feb; Summer = Jun- Aug). Brown shaded regions indicate desert advance while green shaded regions indicate desert retreat. | Natalie Thomas/Sumant Nigam/University of Maryland. More desert poses problems for people in Nigeria, Chad, and Cameroon who live near Lake Chad. The lake is an important source of water on the southern edge of the Sahara. Today, it’s drying up. “Should the rains fail in a one or two-year period due to El Niño or something else, then there could be famine,” said Nigam, referring to the periodic climate pattern over the Pacific Ocean that leads to hotter and dryer conditions in Africa. But a few factors were at play that suggest more work is necessary to understand exactly why the Sahara is growing, said Nigam. Climate and rainfall records show that a phenomenon known as the Atlantic Multidecadal Oscillation, or AMO, alters the temperature of the surface of the Atlantic Ocean, which in turn alters rainfall patterns in the Sahel, the area of north-central Africa along the Sahara’s southern rim. From the 1950s to the 1980s, AMO led to colder temperatures that resulted in less rainfall in that period. Nigam and his colleagues concluded that AMO was responsible for around two-thirds of the Sahara’s expansions. Climate change stemming from greenhouses gases, they said, was responsible for the other third. exerting more influence over weather in the desert, the professor added. Nigam and his colleagues intend to study the question further, including looking at other deserts around the world to see how they might be coping with new natural and manmade weather cycles.